Hakusan, Japan, July 30, 2015 – EIZO Corporation (TSE: 6737) today announced that the RadiForce RX850 8 megapixel monitor significantly improves reader efficiency over a multi-monitor configuration as demonstrated in a research study conducted by the University of Arizona Department of Medical Imaging. 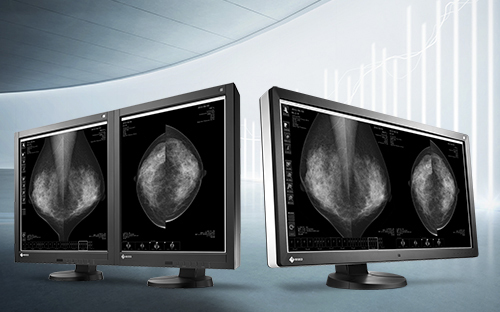 The study, headed by Dr. Elizabeth A. Krupinski, PhD, demonstrated reader efficiency of EIZO’s 8 megapixel RadiForce RX850 compared with two 5 megapixel RadiForce GX540 monitors when viewing mammography images. Radiologists were asked to view a set of mammographic cases, once in each format, and determine for each case if a lesion was present or absent. Overall, the difference in resolution between the RadiForce RX850 8 megapixel monitor compared with the combined resolution of the two 5 megapixel monitors (10 megapixels) did not appear to influence the readers’ ability to detect a lesion, demonstrating consistent diagnostic accuracy with the streamlined single screen. The obtrusive bezels in multi-monitor configurations may cause a disruption of the eyes’ ability to smoothly scan information between two separate monitors. The study showed that the number of times radiologists scanned from one image to the other was significantly less with the RadiForce RX850 compared to the two 5 megapixel monitors. On average, the radiologists spent 62.04 seconds viewing the single screen and 68.99 seconds viewing the dual screens. This showed that the single RadiForce RX850 reduced overall time spent viewing images by an average of nearly 7 seconds (about 10%) compared to the dual RadiForce GX540 monitors. This could contribute to a more efficient mammography workflow by saving time per case. EIZO and RadiForce are registered trademarks of EIZO Corporation.